Madhya Pradesh: Giving major respite to the doctors accused of conducting unethical clinical drug trials in the state, the Indore bench of state high court has set aside the Medical Council of India (MCI) order calling for the suspension of the concerned doctors. The medical Dialogues team had earlier reported that via its order dated July 26, 2017, the MCI had removed the names of these doctors from the Indian Medical Register for 3 months after finding them guilty for violating Indian Medical Council (Professional Conduct, Etiquette and Ethics) Regulations, 2002. Those who faced the MCI’s axe included, Maharaja Yashwantrao Hospital (MYH) superintendent Dr VS Paul, former superintendent Dr Ramgulam Rajdan, Dr Anil Bharani ( Professor) and Dr Ahish Patel (assistant professor) of general medicines department, paediatricians Dr Hemant Jain (currently superintendent of Chacha Nehru Children Hospital), Dr Ujjawal Sardesai, Dr Pali Rastogi and Dr Abhay Paliwal ( psychiatry department). It was alleged that the doctors conducted drug trial on poor patients under the pretext of treatment. The case goes back to the year 2010 when a number of complaints were received by the apex medical council about unethical drug trials taking place in the state, which were undertaken on around 2000 unsuspecting patients. It was alleged that 81 patients had shown side effects and 35 had allegedly died during the trials. 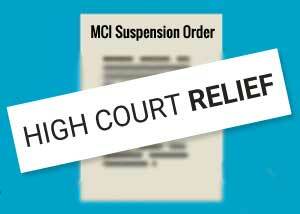 Following the MCI’s move, doctors approached the Indore bench of High Court claiming that the council had not mentioned any provisions violated by the doctors and had not submitted the deliberations by the ethical committee. The doctors alleged in their petition that the MCI misused the rules and regulations in an old case of the drug trial and issued orders against them without giving chance to present their side. “The doctors had followed procedures of the drug trial and taken permission from the ethics committee. A probe by Drug Controller General of India (DCGI) had given them a clean chit in 2012,” the counsel for the doctors, Amol Srivastava and Sunil Jain, presented before the court. Shrivastava told TOI that the court stated in the order that it is clear that no opportunity of hearing much less any personal hearing was granted to the petitioners which are mandatory as per 2002 regulations. “The court has also sympathised with the doctors and expressed concern over the conduct of MCI stating that there is an acute shortage of qualified psychiatrists while such persons who are offering services to the society and the MCI is taking action against such persons in complete disregard of law and procedure,” the advocate informed the daily.